What to eat in Poland? Are you coming to Poland and don't know what to eat? Read this article. We will show you what to eat in Poland. It’s hard to imagine travelling abroad without tasting the most famous foods of your chosen destination. We are sure that whether you visit Poland for a holiday or just for a business trip - you will always be curious about our local specialties. So, this is why we have compiled a list of the most typical Polish food, portraying a broader view of what to eat in Poland. We have even separated our what to eat in Poland list into categories, so that you can more easily discover new knowledge about typical Polish appetizers, soups, mains, desserts and drinks. Let's start our journey through the food of Poland! What to Eat in Poland: Appetizers. Irrespective of whether a typical Pole has been raised in a traditional or modern family, there are always some evergreen snacks served at a Polish table that everybody likes. Ready to go? Ogórki kiszone (gherkins – cucumbers fermented in brine). Before you say that you will never try rotten vegetable, there is no doubt that fermented food has become trendy. And, as we have a lot of fermented food items in Poland, we can definitely say that old-fashioned Polish gherkins are trendy, too! 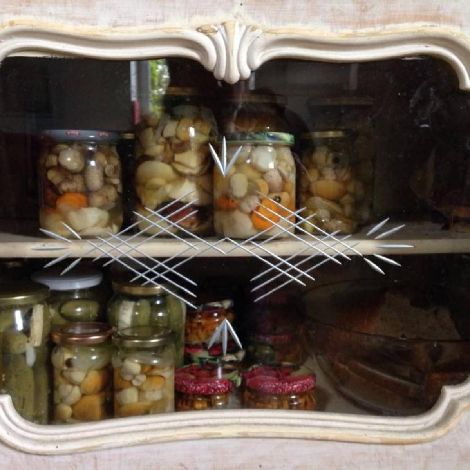 Poles love jars and nearly everybody has made his or her own gherkins at least once in their life. This crunchy, healthy and delicious snack is perfect not only to chase a vodka shot, but to accompany loads of home-made Polish food (pate, sausage, herring or little tartines!). 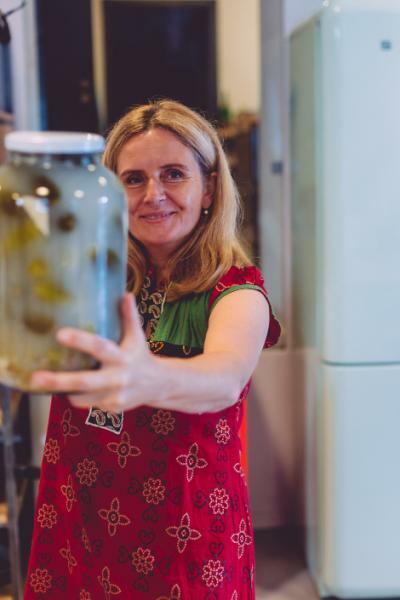 You can find them just about everywhere, but to uncover the most succulent pickles we recommend visiting a local food market or even better - a Polish household. 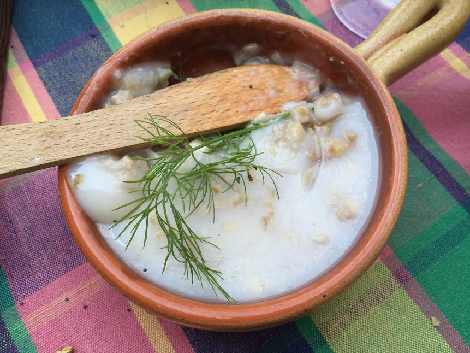 Śledź (herring). This fish may be infamous for its strong smell but when prepared properly it can be a delight and one of the best accompaniments to a vodka shot (remember that your vodka should be freezing cold!). From the Baltic sea to the Tatra mountains, you will find everywhere in Poland some herrings basking in oil or cream. If you visit a restaurant, a local home or a store, you may be surprised by the plethora of diverse herring snacks on offer - a testament to the many tasty ways in which Poles know how to prepare them. Marynowane grzyby (pickled forest mushrooms). By the time you leave our country, you must surely have discovered that Poles are mycophiles! Not only are we forest mushroom eaters, but throughout the summer and autumn months, thousands of Polish people can be found, with their nose in the grass, foraging for fungi. 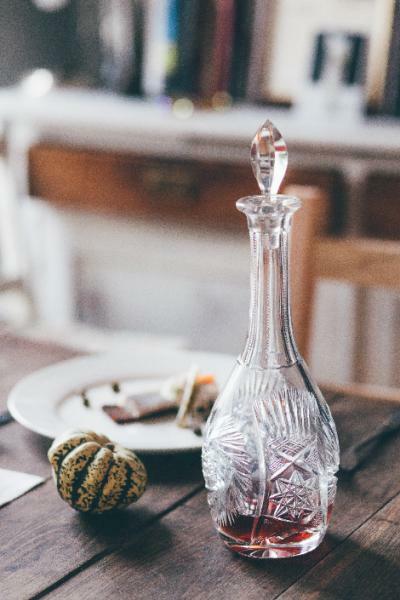 You probably won’t be surprised to hear that home pickled sour porcini, boletus or milk cap mushrooms go very well with a shot of vodka - some say even better than gherkins. Chleb ze smalcem (bread with lard spread). The French may have their famous “rillettes” but Poles have their “smalec”. 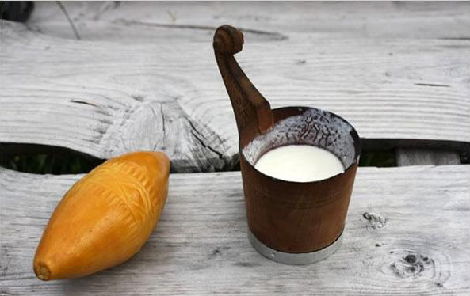 Both contain huge amounts of melted animal grease - so, when it is cold outside and you are tired of sightseeing, we can recommended you some to keep your insides warm. Our smalec is usually flavoured with marjoram, onion, sour apples and tiny bits of pork rind. It tastes best when served on a slice of rye bread and sprinkled with salt. Kiełbasa (sausage). No doubt about it - Polish sausage is a delight for meat eaters! Even Foodies and chefs take delight in rediscovering their age-old mysteries. Where to find them? Easy - at pretty much every market or store. What else about can we say about sausage? Well, a lot. 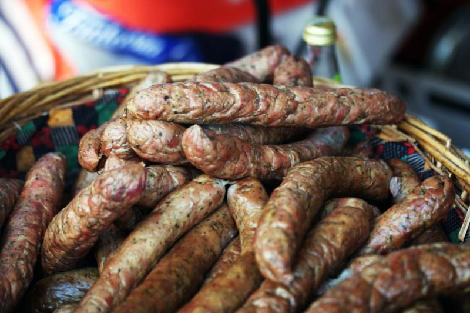 Keep an eye out for the famous "kabanos" – a thin, dry sausage ideal for killing a little hunger. Don't forget to taste some hunter's sausage (myśliwska), or to check out the farmer's sausage (wiejska)! If you’re in Kraków, try the "lisiecka" and "krakowska". When visiting the Christmas or Easter markets, stop by to eat some grilled white sausage (biała kiełbasa) or a blood sausage (kaszanka). Over Christmas and Easter, sausages are traditionally served in slices with cold sides such as pickled mushrooms & gherkins. However, Kiełbasa is typically consumed with a huge slice of bread, a gherkin, some mustard - and, not to be forgotten, a glass of beer. Oscypek (smoked mountain cheese). When you visit any winter capital of Poland, like Zakopane or Kraków, you should always be sure to seek out "oscypek" and other mountain cheeses. Their taste is intense, salty and smoked. Our favorite style of consumption is to grill them and then serve with lingonberry or cranberry preserves. Perhaps you will appreciate them even more along with a sip of Polish cider or beer. Once you taste them, you won’t forget to buy one of the beautifully carved wheels at a local food market. Take it home to shred on your noodle dish, potato pancakes, or whatever you like, in place of pecorino. Galareta / Zimne nóżki (meat in aspic sprinkled with vinegar or lemon juice). Those who were kids in communist Poland remember it well from family parties. Pig or veal trotters in aspic with a shot of vodka is called "seta and lorneta" and was eaten all over Poland by professors, students and physical workers alike, after work or before a party. Old fashioned “galareta” may be a time consuming dish to prepare, but it is still popular. You will find it in many places but the best is, of course, home-made – thanks to the rich flavor obtained by slow cooking. If you have already tried the above appetizers, then you already have some idea of what to eat in Poland. However, if you really wish to get familiar with Polish food, you absolutely have to taste our famous soups, so... it’s soup time! Poles love soups and we eat them every single day, we have for as long as we can remember. Most of our favorite ones have their roots in a distant past - can you imagine that some Polish soup recipes have been recorded in famous old French cookbooks? 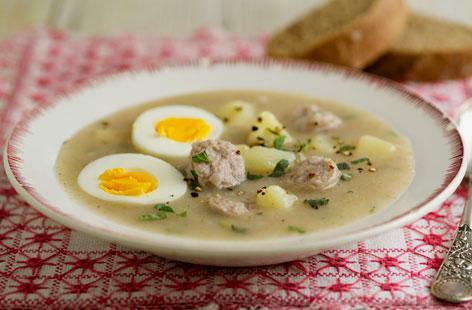 Polish soups are hearty and filling, especially enjoyable on cold, rainy or snowy days. What are they cooked from? Usually meat or vegetable broth, pieces of meat, sausages, vegetables, hard boiled eggs, noodles or cereals. Countless recipes. So, let’s learn about some typical Polish soups! Ready? Żurek (sour rye soup). Sour rye in a soup? Yes, this is what we eat in Poland. Żurek is one of the oldest and tastiest Polish soups and what we add depends on our personal habits, but its taste should always remain acidic. We may add tasty pork sausage called "white sausage" (biała kiełbasa), smoked bacon, meat, potatoes, hard boiled eggs, mushrooms, garlic or a lot of marjoram. Sometimes it is even served in a bowl made of bread. The Christmas Eve version contains no meat, instead including dry forest mushrooms, horseradish, potatoes and eggs. Regardless of profession or social status, this is one of our most loved comfort foods. So very Polish - it’s a must try! Barszcz czerwony (beetroot soup - also known as borscht). We love beets and this is probably why we have so many variations of beetroot soup in Poland. In the summertime, we eat young beets, their roots, stalks and leaves. 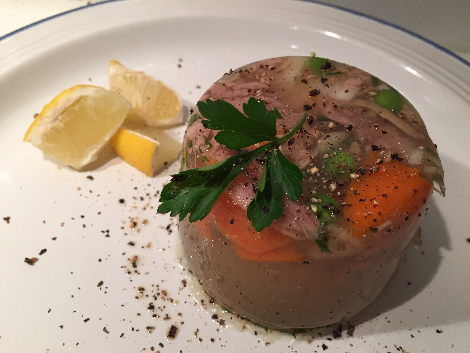 When served warm in a soup, we call it “botwinka”. When served cold with chopped cucumbers, buttermilk or kefir, it is called “chłodnik”. The “everyday” borscht which you will find in many eateries will be served with potatoes, beans, hard-boiled eggs or small savory pastries with cabbage & mushrooms (“kapuśniaczki”). To some, the best version of beetroot soup is the traditional Christmas Eve bortsch. It’s vegetarian, sweet and sour, a bit peppery and served with tiny, delicious raviolis stuffed with dried porcini mushrooms (called "uszka" in Polish, literally meaning "little ears"). Ogórkowa (sour cucumber soup). It’s sour in taste, made of broth, shredded or chopped gherkins. and you either love it or hate it. Potatoes or rice along with chopped dill are typically added and this soup, thanks to its sour taste, is a great hangover remedy. 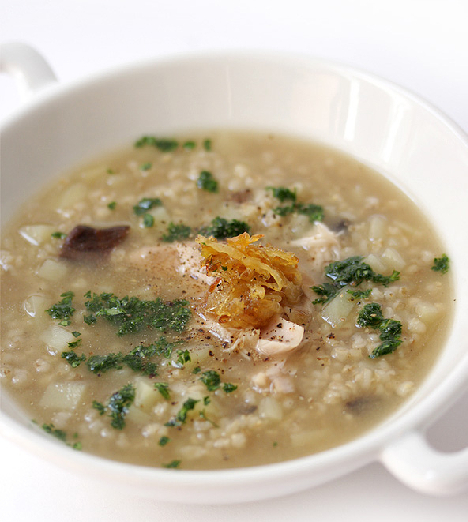 Krupnik (barley soup). This soup is very filling and traditionally for meat eaters; however, you can also find vegetarian versions. Recipes typically use various types of groats and meat and, thanks to those groats, during the winter Krupnik is a wonderful remedy against cold & flu. You probably don’t know this, but in Polish the word “krupnik” also has a different meaning: a sweet honey and herb vodka, easy to find in liquor stores. Flaki (tripe soup). A very old Polish dish - some say that its origins might be traced back to the 14th century! Made of cleaned strips of beef stomach which are cooked in a broth with vegetables and spices (such as large quantities of marjoram - one of the most popular herbs in Polish cooking). There exist two types of tripe soup - Kraków style and Warsaw style. The latter contains delicate meatballs made with marrow and is typically topped with grated parmigiano. 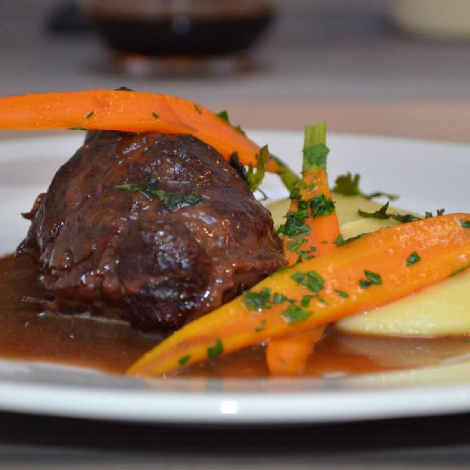 What to Eat in Poland: Mains. Did you know that more traditional Poles actually do not eat lunch? Instead, around 2-3 p.m. they eat a 2 course feast (soup + main) called “obiad” which will be their main meal for the day. But in big cities, the younger, modern working generation have replaced “obiad” with a one course lunch. So... let’s check out the most famous traditional Polish mains! They may not always be dietetic, but they are always tasty and we are proud of them! Pierogi (dumplings). Haven’t heard of pierogi? Hard to believe! Just in case, we will explain what they are. Pierogi are half-circular dumplings filled with a host of different stuffings and eaten boiled, baked, deep fried or pan fried. This most famous Polish comfort food arrived to Old Poland probably around the 13th century from... the Far East. 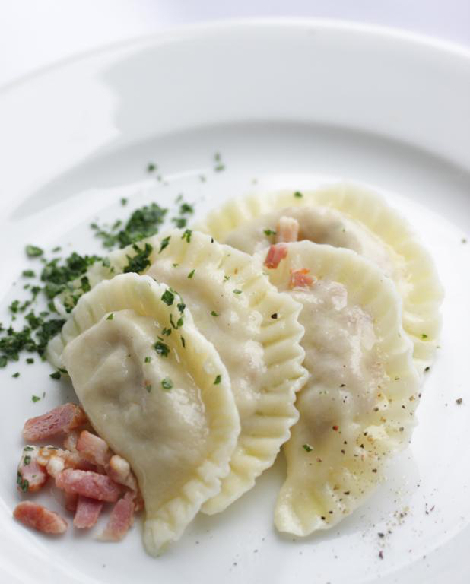 The first written documentation of Pierogi originates from a Polish cookbook published in 1682. Today the most popular variety are “pierogi ruskie” (Ruthenian pierogi when translated literally), stuffed with a mixture of mashed potatoes, twarog cheese and fried onion. Pierogi Ruskie are simply amazing but you can also find them stuffed with meat, cabbage, mushrooms, spinach, groats and seasonal fruits such as strawberry, blackberry, and cherry. Some people even like to experiment with fancy new stuffings. The best you can find will be, as with most Polish food, home-made. How will you find such delicacy? Simple - you can easily contact home cooks in Poland through food sharing website Eataway. 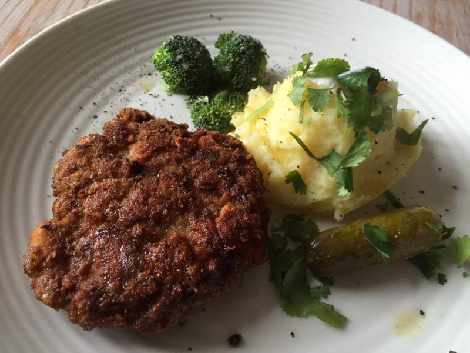 Kotlet schabowy (pork chop). This breaded and fried pork chop served with mashed potatoes and sauerkraut or gherkins became Polish Sunday dinner’s classic only in the 1970s. Nowadays everybody thinks that it has been a national Polish dish since time began. How come? The pork chop first appeared in the 19th century but it became extremely popular only after the Second World War. Due to a shortage in meat supplies, the government developed pig farming. Poland has since become one of the biggest pork producers in Europe, and “schabowy” our national dish! Bigos (hunter’s stew) is not just a simple dish, it’s an institution! Especially beloved during the dark and cold winter months or for extraordinary occasions. 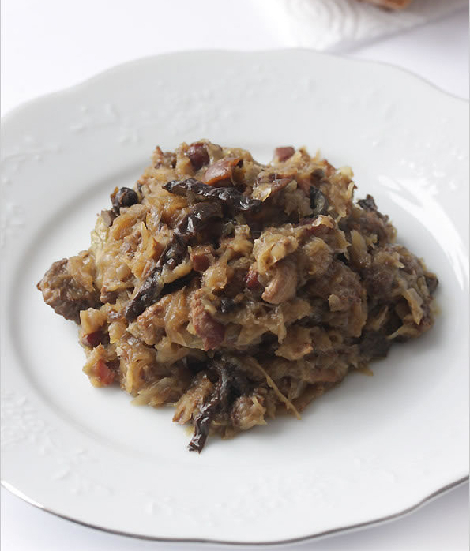 One will never know how many times bigos had been mentioned in Polish literature... but what’s so special about it? To make a long story short: not only does it need sauerkraut and several types of baked meat, but most notably it needs time and love! The longer you cook it over a small flame, the better it is, with some even saying that 3 days is the minimum. The taste should be slightly sour, meaty and spicy with flavor of smoked sausage or bacon. Cookbooks, old and new, cite loads of variety in the creation of bigos. The basic components are the same but some additional ingredients differ: dried forest mushrooms, smoked and dried plums, sour apples, dry red wine or forest spices. In manor houses of old, Bigos was taken on journeys, on hunting trips and was served as the first course of a lunch, preceded (can you guess?) by a glass of vodka! Rolada z kluskami śląskimi (beef roll with Silesian dumplings). A meal that is very popular in Silesia, which is a southern region of Poland known for it’s mining and unique culture. Today, this beef roll can be found all over the country and is usually stuffed with bacon, pickled cucumbers and onion. It is usually accompanied by a gravy, red cabbage salad and the well-loved Silesian dumplings (“kluski śląskie”) - which commonly bear an indentation and are made of boiled potatoes and potato starch. Gołąbki (cabbage rolls). Two things - 1. We love them. 2. Literally, it may mean ‘little pigeons’; but we assure you that its name has nothing to do with this city bird. Cabbage rolls are time consuming to create - made by filling cabbage leaves with a stuffing made of rice or groats and ground meat. Served with either tomato or forest mushroom sauce, rolls simmer or are baked in a broth and they always taste better on the second day. Once more, we will inform you that the most delicious ones are homemade but now we will explain why. In a cheap restaurant, the cabbage leaves are usually not cooked for long enough and the quality of meat is very poor! The same goes for the sauces that they are served with. What to eat in Poland: desserts. What is food without something sweet - what a poor life without a bit of sweetness! Soup, main dish and dessert are a perfect combination, don’t you agree? We have some cool Polish desserts and as Poland is well-known for certain seasonal fruits, lots of them call for heaps of fruit. Any Pole will tell you that our apples are the best, our cherries are the juiciest and our strawberries are the sweetest. What about forest berries? We love them, too, as we appreciate fresh ingredients. Our favourite desserts are cakes, cookies and preserves. Szarlotka (apple pie). 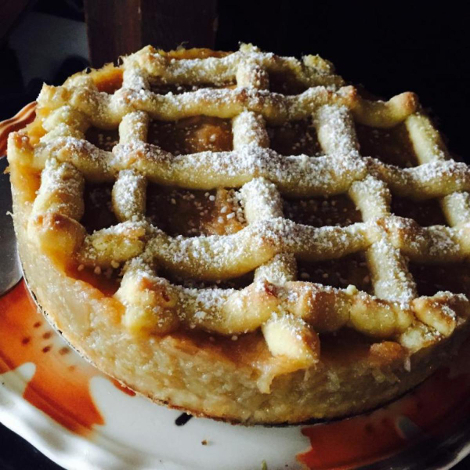 Almost everybody knows apple pie, but the Polish one is unforgettable. Usually we add a bit of cinnamon to our pie, sometimes we serve it warm, sometimes with ice cream or whipped cream. There are tons of delicious apples growing in our orchards and we dare to use them! Sernik (cheesecake). 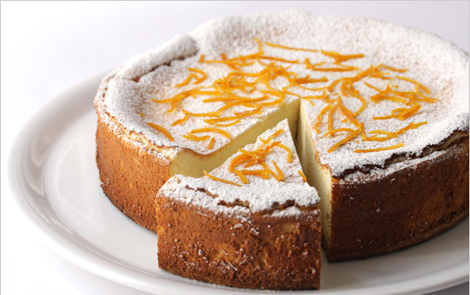 Polish cheesecake dates back to the 19th century. There are many different ways of making it, but it is always baked. Ours is made from a local cottage cheese called twarog, lots of eggs and often raisins, vanilla aroma or with a melted chocolate glaze. In our opinion this classic of all holidays and Christmas’ is light but not too sweet as can be the New York style cheesecake. Makowiec (poppy seed cake). Poppy seed cake is the ultimate Polish cake. Usually, foreigners have no idea that poppy seeds are even used in pastries. It’s typically eaten at Christmas time, but you will find it in pastry shop (Cukiernia) all year round. 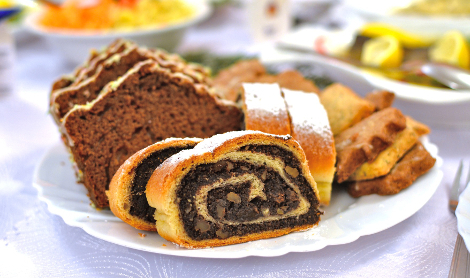 With dried fruit or nuts and covered with icing - for the Polish people, poppy seeds symbolize richness! Krówki (fudge). The most popular Polish candy is a semi-soft, creamy mixture of milk, butter and sugar which have been stirred, boiled and then poured onto a table and cooled. Once it is set, it is sliced into cubes and wrapped in a piece of paper featuring a cow. 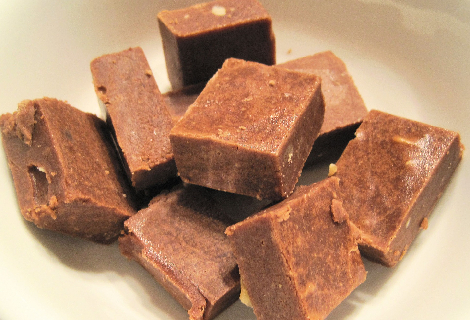 When fresh the candy is chewy, the sugar crystallizes when a bit older, giving the fudge a crumbly exterior. Kremówka (cream cake). The favorite cake of Polish Pope John Paul II, who was born in Wadowice, 60 km from Kraków. In Warsaw; however, it is called napoleonka. One of the best sellers in every traditional Polish pastry shop, the layers of pastry are separated by cream of egg whites, and the top is sprinkled with powdered sugar or covered in icing. What to eat in Poland: or rather, what to drink? Dessert has been eaten and everyone is getting thirsty. There are few options - but what to choose? The most Polish one! Piwo (beer). Definitely the most Polish kind of alcohol. No, not vodka - Beer - fits great with dinner, a snack, a pizza or a football match… but we would recommend you to find some good beer, like a craft one. 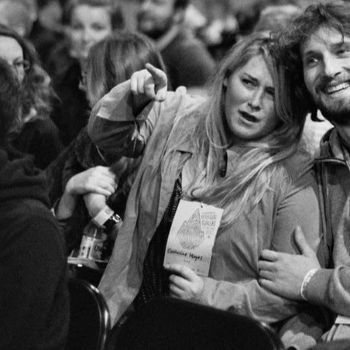 Since a few years past, we have born witness to a kind of “beer revolution”. 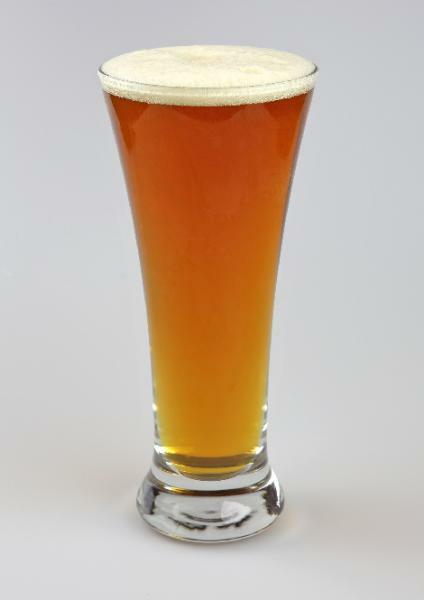 Craft beers are trendy, slowly & well made, tasty and that’s why they are becoming more and more popular. Kompot (cooked fruit drink). Here’s something for the non-alcoholic drinkers. Always made and served by Polish grandmas; pick some fresh fruit (rhubarb, apples, strawberries or chokeberry), bring them to the boil, add sugar , let it cool down and then drink! Bimber (moonshine). A very strong, home distilled alcohol - this is not for lightweights so, of course, it can be found at Polish weddings! Śliwowica is a special kind of bimber, made of damson plums. We already know that you will fall in love with Polish food, ‘cause it’s awesome. So, let us know what your favourite dish was in the comment section below. Smacznego! Magdalena Kasprzyk Chevriaux, Grzegorz Górzyński. Bubbles in Warsaw, my number 1 among restaurants, why? Try potato dumplings with truffle sauce. If you are in Warsaw, whether visiting or living, we invite you to order dishes with delivery at the Akademia restaurant. The best restaurant in the Capital !! !